Be sure to review basic virtual LAN (VLAN) and IEEE 802.1Q trunk configuration and operation from the prerequisite CCNA material. VLAN hopping attacks occur when an attacker tricks a switch into allowing traffic to hop to a different VLAN than the VLAN assigned to the port to which they are connected. Normally, routers are required to route traffic between VLANs at layer 3. Recall “router-on-a-stick” and inter-VLAN routing from your CCNA studies. For traffic to move between VLANs, it needs to be routed either by a router integral to the switch, or by an external router attached to the switch by a trunk port. 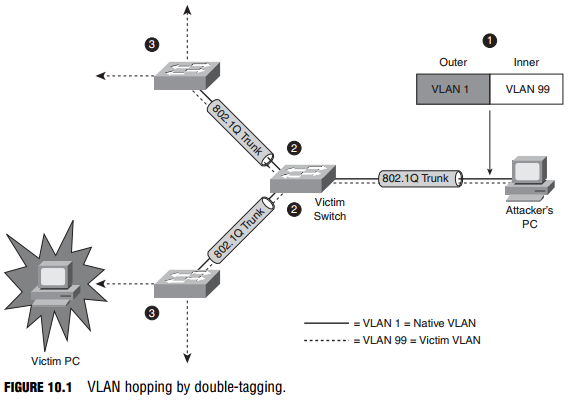 When diagramming the latter scenario, the router appears connected to the switch by a stick, hence the term “routeron-a-stick.” VLAN hopping attacks break this rule, and trick the switch to allow traffic that arrives on a switch port to hop to a different VLAN without involving a router. Unicast traffic: These are frames destined to the user’s PC. Protocol (DTP). The attacker connects a rogue switch to an unused switch port and spoofs DTP messages to automatically negotiate and thus turn on trunking between the rogue switch and the victim switch. The attacker can now send traffic into the network tagged with the VLAN ID of a VLAN that has been learned from the trunk. This is sometimes also called a double encapsulation attack. This type of attack leverages how the switch hardware works. Figure 10.1 illustrates the attack. When most switches receive a frame with 802.1Q encapsulation (indicated by its Ethertype), they unencapsulate them only once, assuming (correctly) that normally 802.1Q frames have only one frame tag in them. Knowing that the switch will only unencapsulate 802.1Q frames once, the attacker will send broadcast or unicast traffic into the switch, hiding a tagged 802.1Q frame inside another tagged 802.1Q frame. For example, VLAN 99 might be hidden inside VLAN 1. There is some guesswork involved in this attack; once the outer 802.1Q frame has been stripped of its tag, the inner frame will only travel in a trunk (to another switch) whose native VLAN is the same as the VLAN tag of the outer 802.1Q frame. Because this native VLAN traffic is not tagged (per the 802.1Q protocol), the inner frame is transmitted in trunks to neighbor switches of the victim switch. Both types of VLAN hopping attacks are only possible when the switch’s ports are misconfigured.